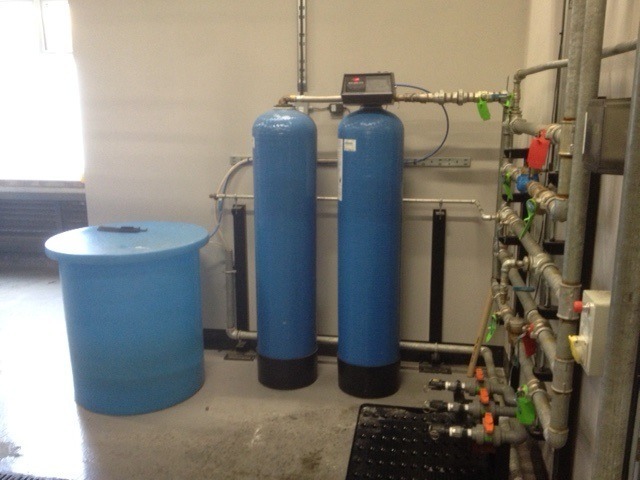 If your business uses water for process or washing / cleaning and you have any issues with fouling or scaling of tanks, washroom fixtures and fittings, or process systems then you might be considering the purchase of a water softener. Softening of water is commonly used for a number of reasons; to keep systems clean and free of scale on heat exchange surfaces, to ensure good water circulation throughout all parts of the system, and to enable evaporative systems to be run in the most efficient manner. Good water quality is important to the operation of many different types of process, and ensures that a minimum of system maintenance is required to keep the water system operating to its full potential. The softening process is the removal of calcium and magnesium salts from the water. Limescale is made up of these salts, which are relatively insoluble and are commonly found in mains and borehole water supplied throughout the country. The removal of these salts from the water ensures that limescale can’t form. Many water systems run most efficiently on blended soft water – AKVO have experienced staff who can advise of the correct ratio of hard:soft water blend, and fit or retro-fit an automatic engineered solution to ensure that this correct ratio is maintained with no input necessary from your maintenance and operational staff. This ensures that your staff can concentrate on their core roles while you have peace of mind knowing your system is running with the optimal water quality. This optimisation process can result in significant savings in the dosing of scale & corrosion inhibitor chemicals – the correct soft water blend means little of either type of chemical are necessary. AKVO can design, supply and install fully automatic water softening units that are right for your application. Water softeners that are not sized correctly can cause more problems than they cure, giving issues with water flow volume, pressure, and of course not addressing the issues that can lead to limescale build-up in your system. AKVO supply plant to treat any water flow rate from a few litres to many tonnes of water, and offer a free softener sizing service, please contact us for more information. The continued efficient performance of your water softener is vital – to give peace of mind and performance data relating to your water softener, AKVO offer a water softener maintenance service. This consists of an engineering visit to the softener to test & report on its performance and strip, lubricate and re-assemble the unit to ensure its continued reliability and efficiency. We offer this service not only to customers who buy our softeners, but also to any existing softener plant you may have that was supplied by others – please contact us for a quote. A water softener offers many advantages to a business. Not only do water softeners remove the scale-magnesium and calcium, which cause scaling of wetted surfaces associated with pipework, process equipment, heat exchangers and tanks; and non-process equipment such as dishwashers, toilets and cisterns, taps, showers and sinks, they will save you in soap and detergents as soft water does not require much soap to make a lather. This has advantages for every water user, and these advantages are multiplied at laundry / vehicle wash premises or facilities such as laundries or food processing companies where washdown water and detergents can be a significant cost. 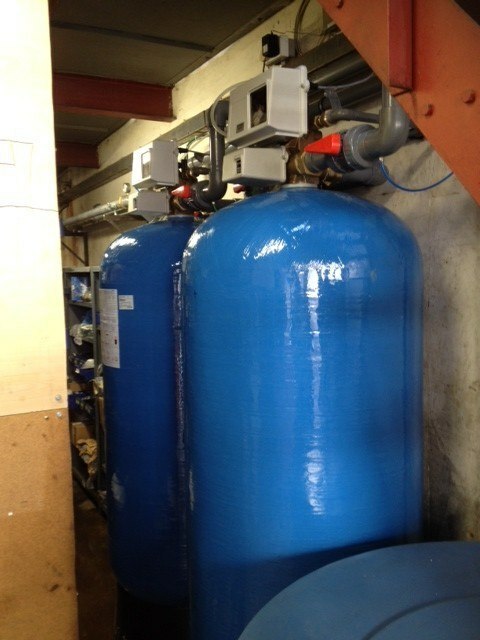 Our supply and installation work includes manufacturer-backed warranty, and also support on how to optimise your softener to ensure it is used efficiently with your site water systems and the exact level of hardness you want to control in your water. Large water softeners can use large quantities of salt and water in their regeneration if they are not installed and commissioned correctly. Our engineers are experienced with installing optimising and refurbishing many different designs of water softener control valve and many different grades of softener resin. They carry an extensive set of spare parts for the most common types of softener control valve, including Fleck, Permutit, Houseman, Kinetico, Autotrol, Siata and Clack, to name a few. This ensures your water softener running costs are as efficient as possible. Carrying out repair work yourself would involve being able to identify which components on your water softener weren’t working, and then dismantling and shipping those parts to the manufacturer. Not only that, but you would then have to wait perhaps a few weeks for the part to be sent to you. Finally, you would have to reinstall the part. Our engineers have many years’ experience of working with softeners, and so time can be saved on fault diagnosis, and the spares package they carry means soft water supply to your process can be restored quickly and efficiently. AKVO is a local business. As such, we support other small businesses in the area, purchasing their company uniforms, advertising materials and similar items from shops located nearby. In choosing AKVO as your water softener supply and repair company, you are choosing to support your local economy, which benefits everyone. When you choose to purchase your water softener repair service, or your new water softener from AKVO, you are more than a number; you are important because you are an individual and the way your business uses water is unique to you. This means that means that you will receive quality service from a company who really cares about the quality of your water, and understands that optimal water process control is vital for your business. Akvo are water softening experts, call us on 0844 244 8726 for more information.